This was the opening of a a new ROCK night on Thursdays. All the staff and some others had these cool, Dr. Evil’s Lab of Rock t-shirts. 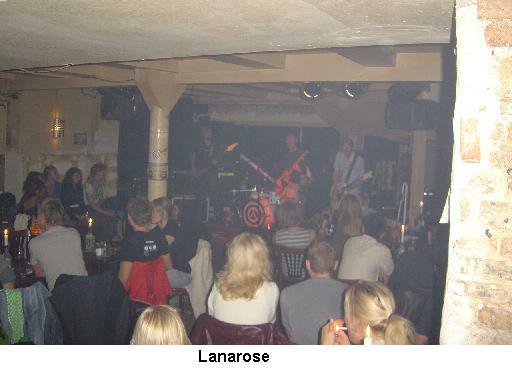 The place was packed when I arrived about 8 and Lanarose were playing. They are a young band with some good riffs and pop music choruses. A bit grunge like perhaps. I only got to see two songs but they used some sampled synths and the lead player did some great solos. Next up was Duality, a band that played very laid back music like a mix of Santana and the Grateful Dead. Their volume was so low that for the first 25 minutes or so you could not really hear much of anything unless you were in the front. They had a bass, guitar, drums, conga-percussion and Fender Rhodes synth player. It was only the last couple of songs you could hear but it was rock night and they were a bit too laid back. People wanted to ROCK! 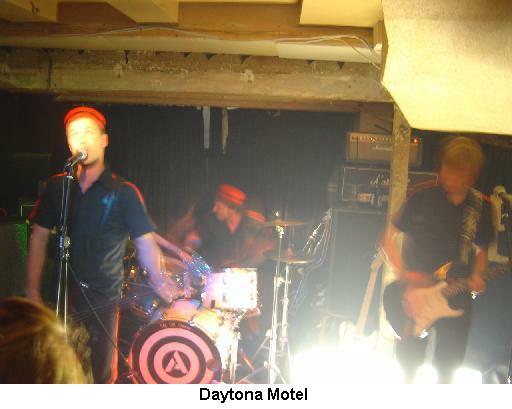 Daytona Motel, the band that I came to see, was up after 45 minutes. It was now 10:45 and they were to play at 20:30. Anyway, the band came out dressed in bellboy costumes and rocked the joint! It really was like going back to 70s style Swedish rock. I was surprised and glad. Not many bands making this kind of music in Denmark. A few of the guitar riffs were like Nebula or something but never for a full song. Not enough guitar soloing but a nice jam at the end of the show. Strong playing by all 3 members of the band. I did not stay to see Aimology so I can’t comment on their performance. A cool place and idea for Thursday night rock! Set list: Shaker, Chicago, Crazy, Hell burn, Female, Luke, Sally, Daytona, Dirty, Hell Yeah!